Well done to Ant & Rich! Regulars at our Saturday morning Fit In The Park class in South Park Gardens, Ant & Rich, decided to do something a bit different last weekend. 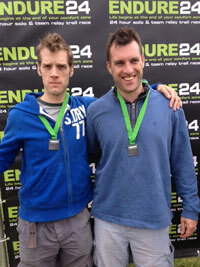 They, plus 2 other friends, completed the Endure 24, a twenty four hour race over a 5 mile loop. They completed a staggering 160 miles between them (40 each!) from Saturday noon to Sunday noon.